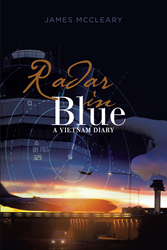 Recent release “Radar In Blue: A Vietnam Diary” from Page Publishing author James W. McCleary is an absorbing autobiography that reflects on the author’s unique experiences as an American air traffic controller during the Vietnam War era, and the complications—military and political—that surrounded the job. James W. McCleary, a former US Air Force Officer and reinsurance executive who grew up in the Bronx with a penchant for gardening and military history, has completed his new book “Radar In Blue: A Vietnam Diary”: an insightful memoir detailing the career of a USAF man during the Vietnam War. Published by New York City-based Page Publishing, James W. McCleary’s new book is a vivid account of one military man’s experiences—excitement, pride, sheer panic, and hard-earned skill—all playing out against the backdrop of a complicated war. In many ways intimate and probing, McCleary’s book speaks to the way a war can uniquely mark a life forever. Readers who wish to experience this contemplative work can purchase“Radar In Blue: A Vietnam Diary” at bookstores everywhere, or online at the Apple iTunes store, Amazon, Google Play, or Barnes and Noble.